A reading list to celebrate works of and inspired by the Situationist International, on the 50th anniversary of the May 1968 uprisings. The uprisings of May '68 were to a great extent fueled by the ideas and politics espoused by the Situationist International. On June 7, in the aftermath of the uprisings, Charles de Gaulle gave a televised speech in which he observed that the "explosion was provoked by groups in revolt against modern consumer and technical society, whether it be the communism of the East or the capitalism of the West." Passages from Guy Debord's Society of the Spectacle, published in 1967, were written on walls in Paris and further afield, and the Situationist belief that social alienation had permeated all aspects of life and culture spread amidst the growing unrest. 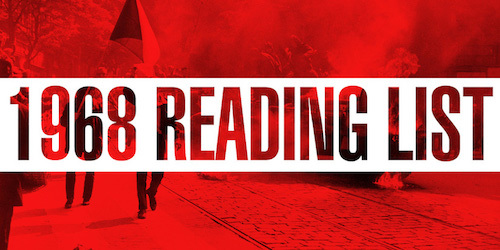 To celebrate the 50th anniversary of May '69 we bring you a reading list on and inspired by Situationist thought, including books by Claire Bishop, David Harvey, McKenzie Wark, Guy Debord and more. The Invention of Paris is a tour through the streets and history of the French capital under the guidance of radical Parisian author and publisher Eric Hazan. Hazan reveals a city whose squares echo with the riots, rebellions and revolutions of the nineteenth and twentieth centuries. Combining the raconteur’s ear for a story with a historian’s command of the facts, he introduces an incomparable cast of characters: the literati, the philosophers and the artists—Balzac, Baudelaire, Blanqui, Flaubert, Hugo, Maney, and Proust, of course; but also Doisneau, Nerval and Rousseau. Over fifty years after the Situationist International appeared, its legacy continues to inspire activists, artists and theorists around the world. Such a legend has accrued to this movement that the story of the SI now demands to be told in a contemporary voice capable of putting it into the context of twenty-first-century struggles. In The Beach Beneath the Street Wark delves into the Situationists’ unacknowledged diversity, revealing a world as rich in practice as it is in theory. Tracing the group’s development from the bohemian Paris of the ’50s to the explosive days of May ’68, Wark’s take on the Situationists is biographically and historically rich, presenting the group as an ensemble creation, rather than the brainchild and dominion of its most famous member, Guy Debord. Following his acclaimed history of the Situationist International up until the late sixties, The Beach Beneath the Street, McKenzie Wark returns with a companion volume which puts the late work of the Situationists in a broader and deeper context, charting their contemporary relevance and their deep critique of modernity. Wark builds on their work to map the historical stages of the society of the spectacle, from the diffuse to the integrated to what he calls the disintegrating spectacle. Artificial Hells is the first historical and theoretical overview of socially engaged participatory art, known in the US as “social practice.” Claire Bishop follows the trajectory of twentieth-century art and examines key moments in the development of a participatory aesthetic. This itinerary takes in Futurism and Dada; the Situationist International; Happenings in Eastern Europe, Argentina and Paris; the 1970s Community Arts Movement; and the Artists Placement Group. It concludes with a discussion of long-term educational projects by contemporary artists such as Thomas Hirschhorn, Tania Bruguera, Paweł Althamer and Paul Chan. In his classic sequence of films, Patrick Keiller retraces the hidden story of the places where we live, the cities and landscapes of our everyday lives. This collection explores the surrealist perception of the city; the relationship of architecture to film; how cities change over time, as well as an urgent portrait of post-crash Britain. The View from the Trainestablishes Keiller as one of the most perceptive writers and thinkers about the city, landscape and politics. Keller Easterling reveals the nexus of emerging governmental and corporate forces buried within the concrete and fiber-optics of our modern habitat. Extrastatecraft will change how we think about cities—and, perhaps, how we live in them. The Situationist International (SI) published the journal Internationale Situationniste that included many incendiary texts on politics and art, and were a galvanizing force in the revolutions of May 1968. The importance of their work has been felt particularly in their revolutionary analysis of cities. The SI were responsible for utopian imaginings of the city, where its alienating effects from its routine use as a site of consumption and work were banished and it was instead to be turned into a place of play. Tom McDonough collects all the SI’s key work in this area for an essential one-stop collection. Including such essential works as ‘The Theory of the Derive’, ‘Formulary for a New Urbanism’, and many previously untranslated texts, the book will also be strikingly illustrated by the images that were core to the Situationist project. 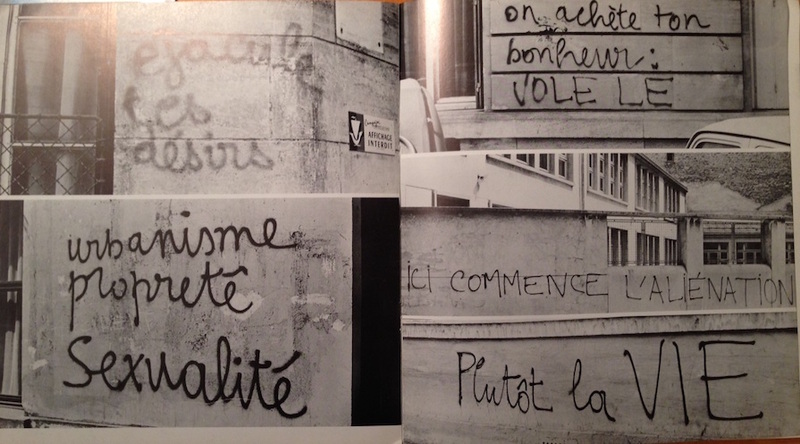 Planning and modernization have accelerated the erasure of its revolutionary history, yet through walking and observation, Hazan shows how we can regain our knowledge of Paris, the city of Robespierre, the Commune, Sartre, and the May ’68 uprising. Drawing on his own life story, as surgeon, publisher and social critic, Hazan vividly illustrates the interplay and concord between a city and the personality it forms. First published in 1967, Guy Debord’s stinging revolutionary critique of contemporary society, The Society of the Spectacle has since acquired a cult status. Credited by many as being the inspiration for the ideas generated by the events of May 1968 in France, Debord’s pitiless attack on commodity fetishism and its incrustation in the practices of everyday life continues to burn brightly in today's age of satellite television and the soundbite. In Comments on the Society of the Spectacle, published twenty years later, Debord returned to the themes of his previous analysis and demonstrated how they were all the more relevant in a period when the “integrated spectacle” was dominant. Throughout his adventurous life, Ralph Rumney was in constant flight from the wreckage of postwar Europe. Crossing paths every avante-garde of the past fifty years, he was one of the founding members of the Situationist International. Rumney’s friends, lovers and travelling companions—Guy Debord, Pegeen Guggenheim Asger Jorn, Michele Bernstein, Bernard Kops, Yves Klein, Marcel Duchamp, Georges Bataille, William Burroughs, Félix Guattari, E. P. Thompson, Victor Brauner, and many others—are recalled in the oral history of The Consul with sharp intelligence and dry wit. The metropolis is a site of endless making and unmaking. From the attempt to imagine a ‘city-symphony’ to the cinematic tradition that runs from Walter Ruttmann to Terence Davies, Restless Cities traces the idiosyncratic character of the metropolitan city from the nineteenth century to the twenty-first-century megalopolis. With explorations of phenomena including nightwalking, urbicide, property, commuting and recycling, this wide-ranging new book identifies and traces the patterns that have defined everyday life in the modern city and its effect on us as individuals. Bringing together some of the most significant cultural writers of our time, Restless Cities is an illuminating, revelatory journey to the heart of our metropolitan world. Plotting expeditions from London, Paris, Berlin, Detroit, Chicago, Las Vegas and Los Angeles, Bradley L. Garrett has tested the boundaries of urban security in order to experience the city in ways beyond the everyday. He calls it “place hacking”: the recoding of closed, secret, hidden and forgotten urban spaces to make them realms of opportunity. The book is also a manifesto, combining philosophy, politics and adventure, on our rights to the city and how to understand the twenty-first- century metropolis. Rebel Cities places the city at the heart of both capital and class struggles, looking at locations ranging from Johannesburg to Mumbai, from New York City to São Paulo. Drawing on the Paris Commune as well as Occupy Wall Street and the London Riots, Harvey asks how cities might be reorganized in more socially just and ecologically sane ways—and how they can become the focus for anti-capitalist resistance.